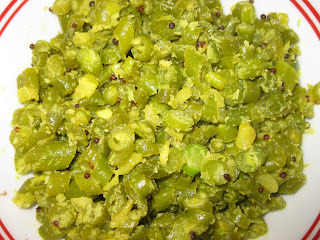 green chilies, salt and turmeric powder and keep it aside for 5-10min. 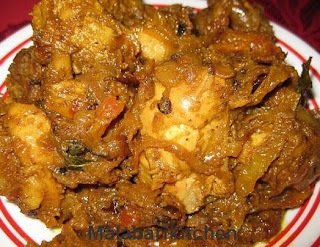 =►Heat 2tsp of oil in a pan and add mustard seeds. =►When it cracks add dry red chilly and curry leaves along with chopped bitter gourd mixture. =►Close it with a lid and allow it to cook for 8-10min on medium flame. 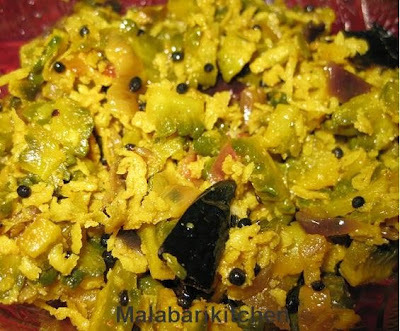 =►Thoran is ready to be served with rice. This participates in Vegetable Marathon - Bitter Gourd, hosted by Nithu and started by Silpa. paavakaai is one veggie i always wanted to try.. yours looks very tempting..